On the second float of the trip we decided to hit a section of the Blackfoot River. This section of the Blackfoot river was remote, and hard to reach on foot. Matt and I crept along on uneven back roads, before dropping the raft in by 9:00 am. 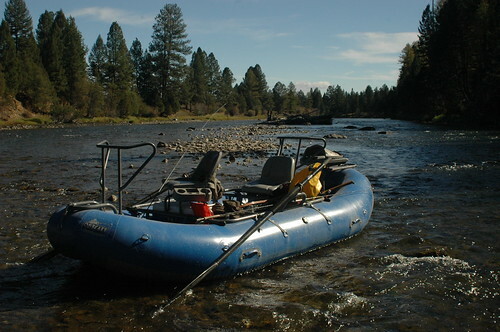 The river was relatively low and clear, which was a major change from the float on the Clark Fork. The clear water wasn’t always good, since it was easy to fall into “aquarium watcher” mode, as I often did. The rocky bottom was interrupted by dark swaying forms that held until the last second, and spooked as we floated over them. In a shallow tail out I spotted a Bull trout, a fish easily over thirty inches. The regulations don’t allow targeting Bull trout, so we floated past. I fished big rubber legged nymphs and small pheasant tails while Matt rowed down the first half mile. The indicator moved a few times, but aside from a couple missed strikes I only landed a big whitefish. Once we reached a good spot the action picked up quickly, and Matt landed a few cutthroats on nymphs. I caught a chunky fifteen inch brown on a streamer in the same run. We were clearly in a good stretch of river as I watched pods of trout and whitefish scatter when the boat’s shadow passed over them. Big trout and whitefish over twenty inches would suddenly become dwarfed when a massive Bull nearly twice their length spooked under the boat. Between the scenery of the landscape and the bottom watching, it was tough to concentrate on fishing. We switched up on the oars as the canyon walls closed in on us, and Matt decided to nymph from the boat. The river changed from meandering oxbows to a steeper gradient, with swift riffles dropping into bottomless pools. Large bluffs and rock formations jutted up from the dark green water, and created a reef type appearance. Matt ran a drift over a slot in the submerged formation, and was immediately into a big fish. The indicator and line kept moving upriver with no sign of stopping. After tiring the fish out in the fast current, he swung it towards the boat and lifted its head. Whitefish! Big whitefish. Our hearts sank briefly before almost stopping altogether when the gaping maw of a 36-40 inch Bull trout inhaled the whitefish. It didn’t swipe or T-bone the fish. Nearly twenty inches and 3-4 pounds of whitefish disappeared into its mouth in one bite. Not so much as a few fluttering scales were left in the water. The huge purple and black form with vivid yellow spots dissolved into the depths of the dark green water. Gone. It was an unforgettable moment. By mid afternoon tricos were dancing in the air in addition to clouds of mahagonys. I was casting a small black zonker, and caught a pretty seventeen inch cutthroat. The canyon opened up and I started taking pics and video of the distant mountains. I put the cameras away as we neared a nice looking logjam. 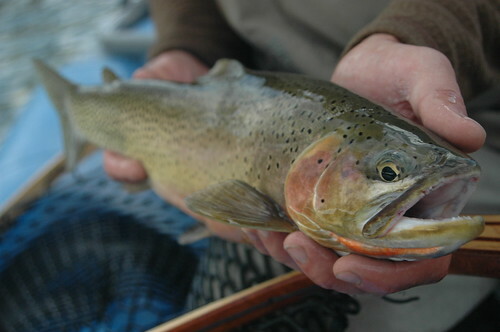 Matt cast the streamer into the structure and caught two big cutthroats in quick succession. We moved down river to another good looking spot. It was my turn on deck, so I tossed the streamer into a deep riffle. I was rewarded with a hard strike, and the big cutthroat above, my biggest of the week. I handed the rod to Matt, and he quickly hooked into a fat rainbow. The sun was setting, the takeout was around the corner, and we spent a day on water both scenic and productive. 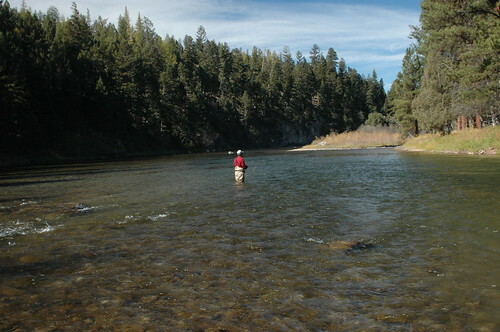 In the latest video post I filmed fishing and floating on the Blackfoot River, Montana. This entry was posted in fishing report, video on October 19, 2010 by Jason du Pont.